Dr. Kathy Pritchard is currently the Departmental Division Director (DDD) for Medical Oncology at the University of Toronto (UofT), Professor in the Departments of Medicine and Institute of Health Policy Management and Evaluation (IHPME), and a Senior Scientist at the Sunnybrook Research Institute (SRI). She graduated from Queen’s University [B.A. (Science) 1968 and M.D. (1971)], and trained in Internal Medicine and Medical Oncology as well as completing two years of Fellowship in Clinical Trials in Melanoma and Breast Cancer all at UofT. Dr. Pritchard was the first to show that tamoxifen is effective and equivalent to ovarian ablation in premenopausal women with metastatic disease and one of the first to describe its role in postmenopausal adjuvant therapy. 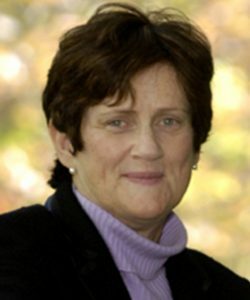 She co-designed, co-conducted and co-published the practice changing NCIC CTG MA.17 study, the first trial that showed that an aromatase inhibitor (AI) or any endocrine therapy could further reduce recurrence rates and improve overall survival in post-menopausal women who had completed five years of adjuvant tamoxifen. Dr. Pritchard has been Chair/Co-Chair of the Early Breast Cancer Collaborative Group (EBCTCG) since 2000 and has been responsible, together with the Oxford Overview Secretariat led by Sir Richard Peto for the publication of a series of articles examining the role of endocrine therapy (tamoxifen, ovarian ablation, aromatase inhibitors), bisphosphonates, radiation therapy and various types of chemotherapy in the treatment of early breast cancer following primary surgery. Dr. Pritchard was named as one of the top 1% Highly Cited Researchers worldwide (2014 and 2015) by Thomson Reuters.